Part two of a four-part series. Read parts one, three and four. KETURA, Israel -- The first prime minister of Israel, David Ben-Gurion, once had a vision to "make the desert bloom." Through innovation, arid regions of this country were successfully turned into bountiful farmland. Now Israelis are harvesting another resource: renewable energy. 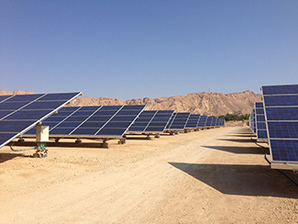 In 2011, the solar photovoltaic company Arava Power Co. pioneered the first commercial solar project in Israel with a 4.95-megawatt solar array at Kibbutz Ketura in the southern region of Eilot. "Our goal was to create a solar revolution in Israel and really allow renewable energy to be a significant part of the Israel energy mix," said David Rosenblatt, vice president and co-founder of Arava Power, who splits his time between Israel and his home in New Jersey. While Israel has been a pioneer in clean technology development, it has been a laggard in renewable energy deployment. Arava Power underwent a painstaking, multiyear process to pave a regulatory pathway for building commercial solar projects in Israel. The company found success in partnering with kibbutzim, small Jewish settlements, and Bedouin groups to lease their agricultural land. "In our mind, we would still be farming, but farming the sun," Rosenblatt said. "That's how we look at ourselves, as farmers of the sun." Today, Israel's renewable energy sector is starting to flourish. The region of Eilot currently has more than 25 solar projects in the pipeline and a total installed capacity of 400 MW expected by 2020. Because Eilot consumes only 120 to 140 MW of electricity, local leaders have said it will become entirely energy independent within two years and capable of exporting surplus power to cities in the north by 2016. Last fall saw the launch of the region's second major commercial solar photovoltaic array, the 8 MW project at Kibbutz Neot Smadar. And at the end of the year, an 11 MW field came online at Kibbutz Samar. New solar farms combined with a collection of dispersed rooftop panels will bring the Southern Arava Desert's total solar capacity to 60 MW by the end of March. A separate initiative farther north in the Ashalim area of the Negev Desert has 250 MW of concentrated solar power and photovoltaic projects in the planning, which would make up about 2.5 percent of Israel's overall energy needs. Arava Power pioneered this first commercial solar farm in 2011, hoping to spur "a solar revolution." Photo by Julia Pyper. Israel isn't only rich in solar; it also has an estimated 2.5 gigawatts of onshore wind capacity. Last year, the Northern District Planning and Building Committee approved the building of a 120 MW project in the Golan Heights. The Emek Habacha project will be one of the largest in the Middle East. But support for wind energy has been inconsistent because Israel lies on a major migratory bird path and the military has expressed concern that turbines could interfere with aircraft and surveillance. In 2012, the government approved shifting a 300 MW renewable energy quota from the wind energy sector to the solar energy sector. Last month, the Israeli parliament, the Knesset, launched an initiative to become "the greenest in the world." The multiyear project includes a 1.1-acre solar field. Palestinian authorities have also placed an emphasis on solar power with a goal to deploy 65 MW by 2020, as part of a 130 MW renewable energy goal. Palestinians, who get all their electricity from Israel, cut the ribbon on their first solar farm in Jericho in 2012. The Czech government sponsored a 120-kilowatt solar project in Tubas last year and currently has 350 kW of solar capacity up for tender. "The whole renewable energy field is brand new in Palestine," said Ayman Kaloti, co-owner of the Palestinian renewable energy contracting company 3K Solar. Electricity companies are still developing their technical know-how, and the private sector is only just getting off the ground. But, he added, "It's going to be a booming market for sure as part of the Palestinian strategy for economic development." To reduce greenhouse gas emissions and boost energy security, the Israeli government set a goal to generate 5 percent of the country's electricity needs from renewable energy by 2014 and 10 percent by 2020. But as Israel moves toward reaching these goals, some are worried the enthusiasm for renewable energy could fade with the recent discovery of vast offshore natural gas reserves. 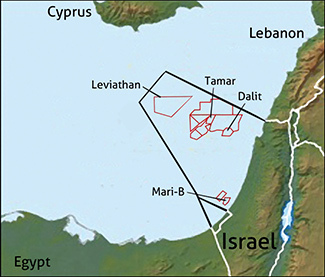 The Leviathan field, located about 80 miles off the coast of Israel, holds an estimated 18 trillion cubic feet (tcf) in natural gas reserves. Another large offshore play, the Tamar field, is expected to hold up to 10 tcf in recoverable reserves. According to a 2010 U.S. Geological Survey report, the Mediterranean's Levant Basin may hold an additional 122 tcf of undiscovered natural gas resources. These finds could drastically change Israel's energy landscape. There have already been rapid changes. Natural gas was introduced to Israel's energy mix in 2004, and by 2010 it provided 40 percent of Israel's electricity; the remainder was generated by coal and a marginal amount of diesel and fuel oil. By 2015, natural gas consumption is expected to reach 50 percent, according to the Ministry of Energy and Water Resources website. The switch has already reduced Israel's domestic carbon dioxide emissions and saved billions in energy costs, a trend that's expected to continue as more natural gas comes online. Last year, the Knesset announced its decision to support the export of natural gas, which is expected to provide increased revenues. Experts say Israel now has enough natural gas to meet its local energy needs for the next 40 to 50 years. The availability of cheap gas could reduce some of the momentum behind clean energy deployment. "I think it's fair to say that the extent to which there are cheaper, more readily available and cleaner fossil fuels, it reduces the incentives to look for energy sources that are renewable as opposed to nonrenewable," said Steven Popper, senior economist at the U.S. nonprofit policy think tank Rand Corp. and the lead author of a 2009 report on natural gas and Israel's energy future. But Shlomo Wald, chief scientist at the Ministry of Energy and Water Resources, says the natural gas boom will not derail Israel's renewable energy agenda. Homegrown energy. 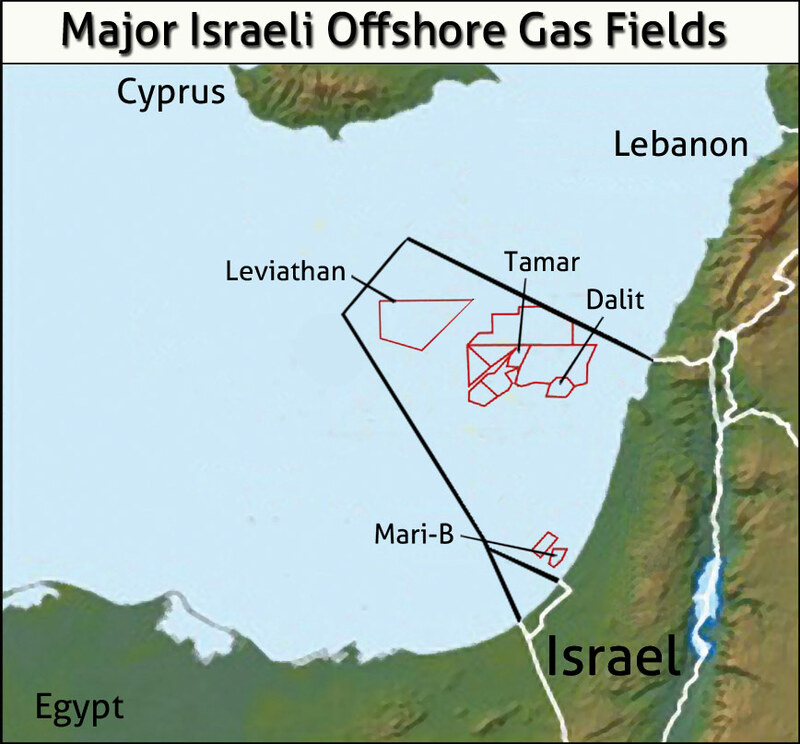 Israel estimates it has enough offshore gas to supply it for 50 years. Click to enlarge. Map courtesy of the Jerusalem Center for Public Affairs. "Natural gas is a major, major revolution in the Israeli energy market because this is the first time Israel has a local energy source for our own. I think it will change the landscape because it will provide Israel with cheaper and locally available energy and it is an extremely, extremely important issue," he said. "But it doesn't contradict the urge to build renewable energy. "A lot of people say, 'We have lots of gas, we need to invest less in renewable energy,'" Wald added. "But I think most serious people don't consider it an alternative." An energy island like Israel can never rely on one resource and still have a robust and stable energy system, he explained. Solar and wind power also complement base-load energy sources like natural gas to help extend their supply. So while some in Israel have pointed to the gas boom as a reason to curb renewable energy investments, the need for diversity will keep renewable energy high on the country's agenda, Wald said. "I don't think that natural gas is in any way competing with renewable energy," he said. "It will fill a gap that was once filled by imported coal and imported oil -- this is the revolution of natural gas."